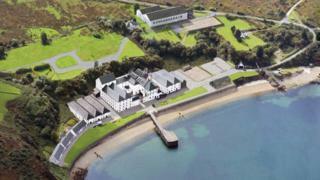 A remote distillery on Islay is undergoing a £10.5m refurbishment programme. Drinks firm Distell International said it had launched an "extensive upgrade and refresh" of Bunnahabhain Distillery. Over three years, the company plans to restore a number of original buildings, while others will be removed and relocated to create more space. The revamp will include the creation of a new "brand home" and visitor centre. The Bunnahabhain Distillery was founded in 1881. Derek Scott, brand director for malts at Distell, said the investment at Bunnahabhain was aimed at improving the operational side of the distillery for the long-term. He added: "Bunnahabhain has a special place in Islay's whisky heritage and we are committed to retaining this by turning Bunnahabhain Bay into a world-class whisky destination of choice. "As the most remote and northerly distillery on the island, our transformation will give those who have made the journey time to pause, forget about the rest of the world and enjoy the serene surroundings."